Christened the Cradle of Liberty, Faneuil HallÂ’s vital role in revolutionary politics hadnÂ’t been part of its original plans. Peter Faneuil, a wealthy merchant, built the hall as a center of commerce in 1742. While the market stalls on the first floor house successful shops to this day, it is the second floor meeting hall that has the greater legacy. It was at Faneuil Hall in 1764 that Americans first protested against the Sugar Act and the Stamp Act, setting the doctrine that would come to be known as no taxation without representation. Gatherings to protest the Stamp Act, the Townshend Act, and the Redcoat occupation would follow, as would one of the first in a series of meetings that would culminate in the Boston Tea Party. The statue of Samuel Adams in front of Faneuil Hall could not be better placed, for it was here that he did his greatest work, dominating town meetings and staging a funeral for the victims of the Boston Massacre. The third floor is Headquarters for the Ancient and Honorable Artillery Company of Massachusetts, the third oldest chartered military organization in the world and the oldest in the western hemisphere. 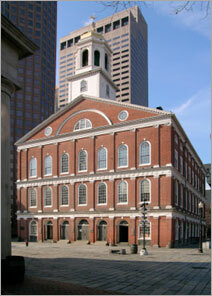 Following the Revolution and to this day, Faneuil Hall retained its position as a stage for debate. Faneuil Hall was rebuilt 1763 when it burned down. Charles Bulfinch redesigned the current building in 1805. 파뉴일 홀은 시청 앞에 위치해 있는 3층의 붉은 벽돌건물로 1742년 유복한 무역상이었던 피터 파뉴일이 보스톤시에 기증한 건물입니다. 이곳은 집회와 시장의 기능을 했었는데 현재까지 시민의 자유로운 토론의 장으로 쓰이고 있으며, 미국혁명의 발상지로서 유명합니다. '자유의 요람'이라고 불리기도 하는데 이는 새뮤얼 애덤스가 문명민족의 발상지라는 의미를 가진 요람의 다른 뜻에서 착안한 것이라고 합니다. 애덤스를 중심으로 독립이 될 때까지 미국독립을 위한 연설을 했고 케네디도 이곳에서 연설을 한 적이 있다고 합니다. 지금은 1층은 상가, 2층이 집회소, 3층은 박물관으로 사용되고 있으며, 프리덤트레일의 한 유적으로 보존되어 그 아름다운 건축양식과 역사적으로 주요한 유적지로서의 면모를 보여주고 있습니다. 위치 : Bet. Congress St.